Michael Nadler '10 was elected to the NESCAC Men's Lacrosse All-Conference Team, becoming Bates' second defenseman on the team in as many years. HADLEY, Mass. 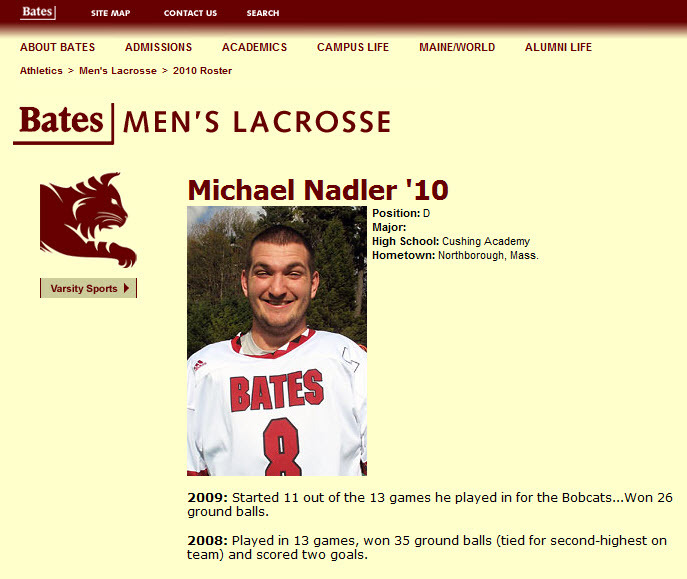 -- Bates senior defenseman Michael Nadler (Northborough, Mass.) was named to the 2010 NESCAC Men's Lacrosse All-Conference Second Team, announced Tuesday by the New England Small College Athletic Conference. Nadler started in all 13 of Bates' games this season and led the Bobcats in ground balls with 47 and in caused turnovers with 18, in addition to one goal and one assist. 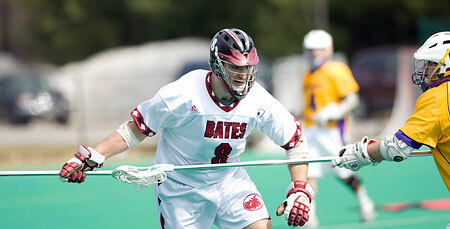 A physical and intimidating defender as well as one of the team's tallest and heaviest players, Nadler served as a team captain for Bates and may have been the team's most vocal leader. Nadler transferred to Bates as a sophomore from the United States Military Academy, and in his three years as a regular starter in a Bobcat uniform he accumulated 108 ground balls in addition to three goals and one assist.